Preliminary details about the contents of the Winograd Committee’s report regarding the country's leadership during the Second Lebanon War were leaked over the weekend and sent the country's leadership into a frenzy of defensive and offensive political maneuvering as the country counts down to official release of war committee's findings. A report broadcast by Israel's Channel 10 news claimed on Saturday evening that the committee found Prime Minister Ehud Olmert failed to put into action emergency plans drawn up long before the war. Fearing it would result in heavy casualties, Olmert resisted a ground incursion into Lebanon but presented no cohesive alternative in its stead due to a lack of structured planning. According to the committee, the war was grossly mismanaged and decisions were hastily made in the ensuing chaos. According to the report, the committee faulted the entire wartime decision-making process and said it was not up to the standard of leadership necessary during an emergency situation. Olmert’s office said in response that the prime minister had not yet received the report and therefore was not aware of its content. Officials at Defense Minister Amir Peretz’s office were noticeably relieved that the report seemed to offer tolerable criticism of Peretz, who in the immediate aftermath of the war bore the brunt of most of the public's rage. The committee accused Peretz of failing to make up for his lack of military experience and failing to utilize the defense-oriented resources at his disposal. 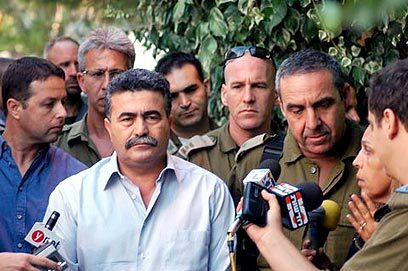 Peretz, according to the committee, preferred to convene a private forum which bypassed the ministry of defense so that in the end he was running the war with Olmert with a complete lack of the necessary knowledge. The committee further said that Peretz's decision to run the war in this manner was motivated by irrelevant personal considerations and that perhaps he was negligent in accepting the post of defense minister in the first place. committee releases its findings. All other cabinet ministers declined comment on the leaked findings. Meanwhile, opposition forces from both ends of the political spectrum were quick to call for Olmert's resignation. Likud chairman, MK Benjamin Netanyahu, and Meretz chairman, MK Yossi Beilin, met secretly on Friday to discuss the report and the political agenda it would create. The two discussed the possibility of elections and agreed that Olmert must not remain in power. "Olmert's fate will be similar to that of Golda Meir's after the Yom Kippur war," said Beilin. MK Effie Eitam (Nationa Union-NRP) called for elections and said that "the commission's conclusions on Olmert, Peretz and Halutz's failures verify the public's feeling that the government had failed and that it should resign." The chairman of Eitam's party said that if Olmert did not resign he would bring forward a motion to disperse the Knesset. The Forum for Bereaved Families welcomed the report: "This is what we've been saying for nine months, even the committee appointed by those being investigated established that the prime minister and the entire government are responsible for the terrible failings of the war." Meanwhile military officials were unsurprised by the committee's findings regarding former Chief of Staff Dan Halutz – arrogance, underestimating the Katyusha rocket threat Israel faced and quashing criticism within military ranks. Halutz is also accused of failing to provide the government with viable alternatives. A senior military source told Ynet that even though Halutz himself has already resigned the report may implicate those senior officers who followed him blindly, still carries significant weight for the army as it may implicate senior officers who remain in the service. While the report lays the blame largely on Halutz, as the man who made most of the crucial wartime decisions alone and without counsel, military sources say that senior officers who followed Halutz blindly may also find themselves out of the IDF after the report is published, namely Intelligence Chief Major-General Amos Yadlin. See all talkbacks "War report scathing for Olmert, Peretz"